This last short post finishes the four part series of my tour called A Matter of Taste: Ceramics and Culinary Connections at the Museum of Anthropology at UBC. 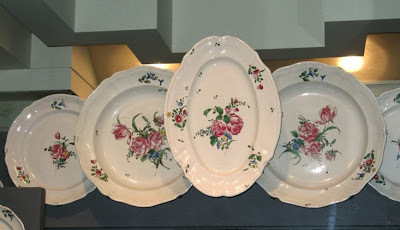 By the period of this French dinner service, around 1770, while still made of tin-glazed earthenware, plates had begun to have more variety in shape and so now there were soup plates and matching serving platters, and gravy boats. As you can see the edges were also a bit more varied. 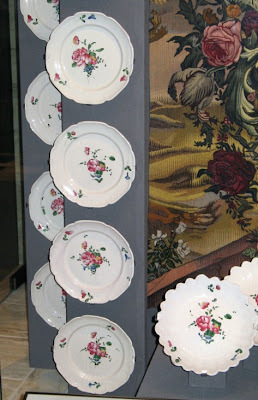 The floral motif of decoration also reflects the idea that flowers were used in cooking much more so then than we do today. 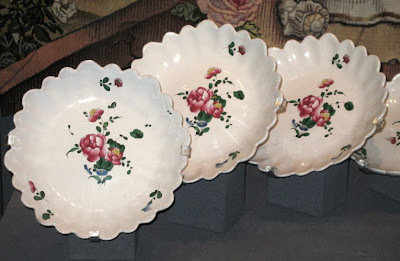 Marigolds, violets, calendulas, roses and lavender for example were often included in food preparation in earlier times. saying this and I didn’t write it down. 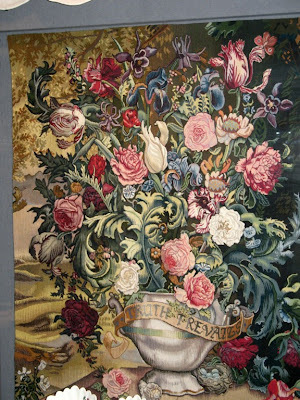 Ruth Jones is an accomplished tapestry artist who works in the Aubusson tradition and in fact she completed the graduate program in Tapestry Design and Production from the National School for Decorative Arts in Aubusson, France. The final part of the tour included a taste of mead and some cookies made with flowers. Mead is still made by Middle Mountain Mead nearby on Hornby Island. This is from their website which is very interesting if you would like to explore there. Mead is wine made from honey and water, often flavoured with herbs, fruits, spices and other botanical elements. 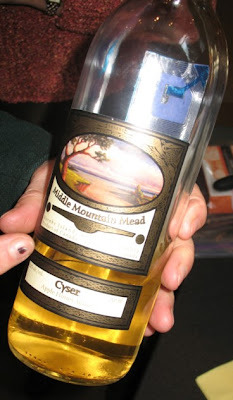 Middle Mountain Mead is an artisan honey winery combining the best of ancient and modern techniques to create small lots of premium handcrafted mead. As well as being a superb wine, mead has been central to rituals of celebration and remembrance down through the ages. I hope you enjoyed this glimpse into the world of ceramics and their food connection. If you missed the earlier posts in the series click for one, or for two and finally for three.